17 March 2013: We celebrated St Patricks day with a Pot Luck lunchtime at the Peveril Solar house for the Tall Building students. It was raining all the time, and has done so for the last three pot lucks at the house - so yet again, I could take students onto field to look at the house from Sharp Hill - and no sunshine to show how the panels work. Group photo of the Tall Building group. 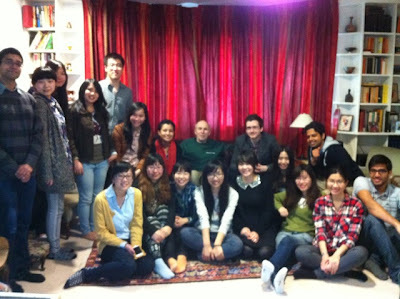 I am really grateful that everybody came except one who was working and the other living in Peterborough - thanks! 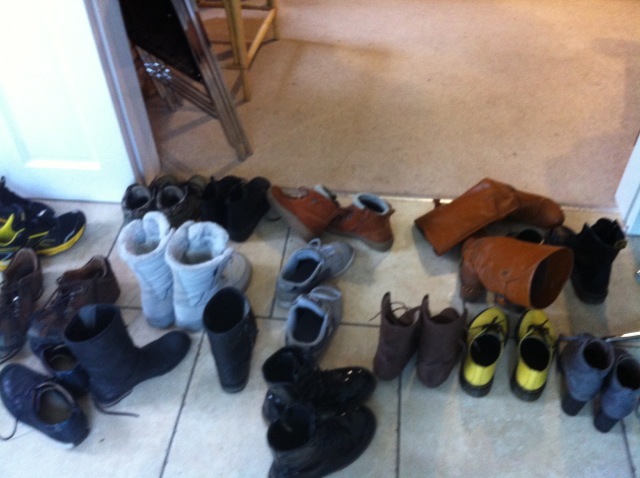 It was another rainy day, so everybody is polite and takes their shoes off before going on the carpet! Its great to know that people are so keen and conscious in removing their shoes before going inside the solar building house. they are all Chinese, Vietnamese, Indonesian or Indian, so have been trained all their life by mums and dads to take shoes off in a visitors house! It was raining all day, so Im grateful for this, shoes were wet.